Marin GreenPlay Camp is . . .
All children should have a fun childhood spent playing outdoors and exploring the place where they live. California's incredible green spaces are the perfect places for your child to fall in love with the Earth. For 10 years, GreenPlay’s guides have been helping parents to teach kids their "ecological address," that keen sense of the place where they live that will encourage them to cherish it as adults. GreenPlay lets kids explore and give back to their place through service with native plant restoration projects, beach clean ups, citizen science, and many other volunteer activities. Today's GreenPlay adventurers will be tomorrow's leaders! We believe that experiences in nature can meet kids where they are developmentally. A challenge or worthwhile learning experience for a kindergarten age child is very different from one that meets a third grader or a sixth grader or a tenth grader. Many years of designing environmental experiential curricula for children means we offer the right lesson and game at the right time in the life of your child. 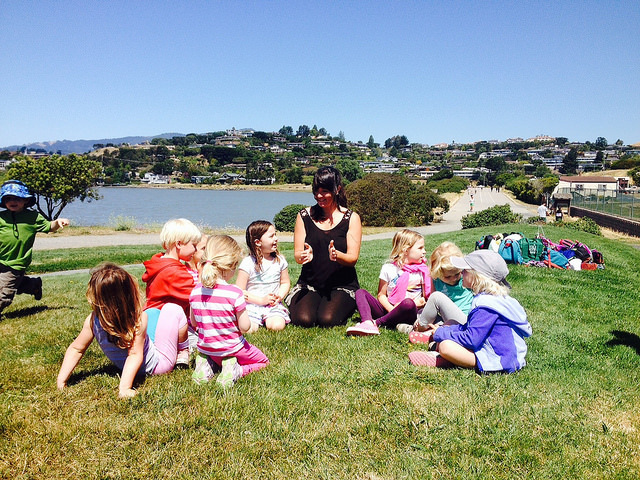 Marin GreenPlay Camp Guides are nature people and kid people. Their only concern is seeing your child thrive with the experiences that GreenPlay can provide. Our guides are locals and have college degrees or equivalent life experiences. We pay them among the highest wages in the day camp sector. Let us show you what happens when happy people who love having fun outdoors share that excitement with your children. The green meadows, rocky shorelines, pristine beaches, lovely lagoons, shady creeks, sandy deserts and mountain trails of Marin County, California are our playground. Working with government, non-profit and private land stewards on service projects means we leave the places we explore "better than the way we found them," in the words of legendary local conservationist and naturalist Elizabeth Terwilliger.